← Have a Very Disney Christmas with Mickey, Goofy, Tron, and V.I.N.C.E.N.T. 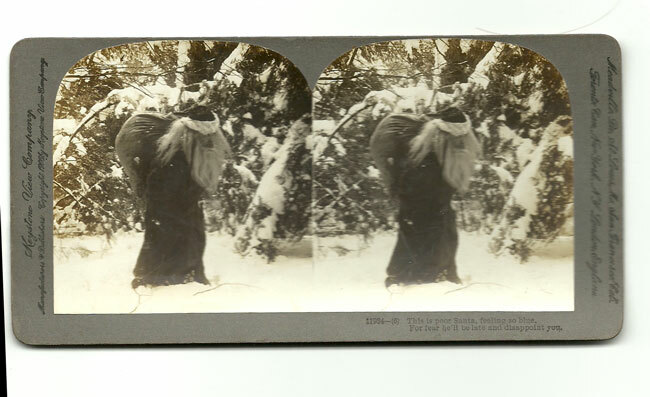 Pick of the Week: Sad Santa Story Told in Six 1906 Keystone Stereo Cards – Or a Real Nightmare Before Christmas! We haven’t featured a “Pick of the Week” in a while, but we wanted to share last weekend’s holiday-themed find with you. It’s a set of six stereo cards published by the Keystone View Company in 1906 that Jim and I picked up for $15 at a local antique co-op. We may get all nostalgic about a kinder, gentler spirit that prevailed a century ago, but these cards will prove once and for all that that notion is false, and that people in the “olden days” had cruel senses of humor just as they do today. 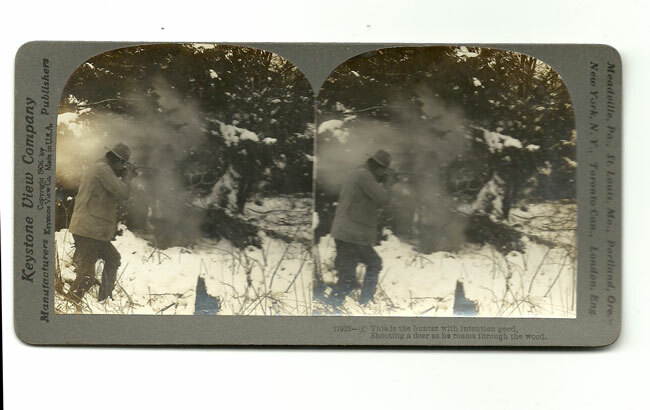 Indeed, I doubt that most people today would tolerate the story that unfolds on these stereo cards, and that’s what fascinates us about them. 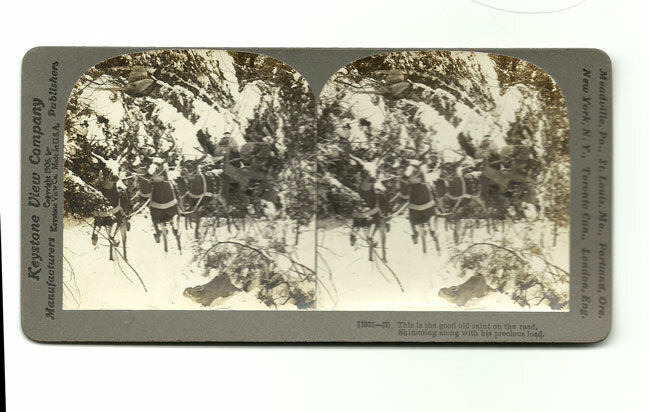 I should note a little history about the stereoscope (sometimes also called a stereoptican) and the double-image cards that it used. This simple, hand-held device was found in most American homes between 1860 and 1920. It allowed the viewer to see a 3-D image when the two photos “blended” into one. Subjects on the stereo cards ran the gamut from tourist views of famous sites and cities around the world to humorous images that told a little story. Presidents, kings, generals, and other people of note also had their likenesses appear on stereo cards. The Keystone View Company was founded in Meadville, PA in 1892 and continued operation until the 1960’s. They really cornered the market on educational stereo views and eventually survived longer than any of their competitors. In 1905, a year before our set of cards was copyrighted, Keystone was the largest stereographic company in the world. In addition to educational views, humorous cards were a mainstay of the company’s vast catalog, and that’s where our cards come in – if you can call them funny. You be the judge. 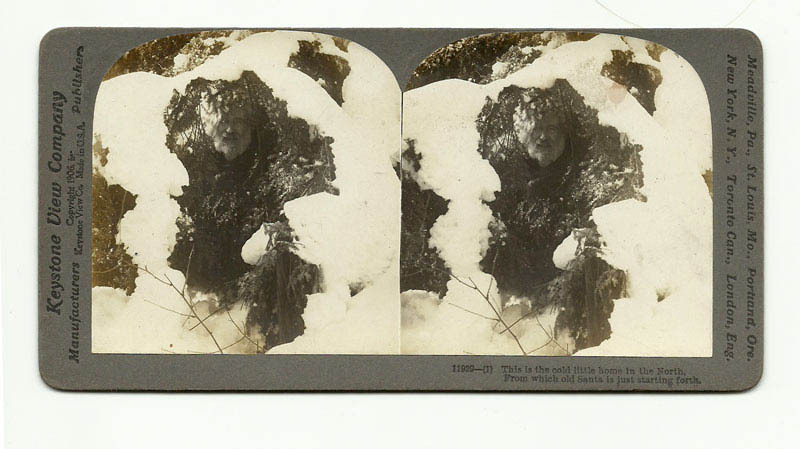 Card #1 shows a “real” Santa with a real, somewhat short beard peeking out of a snow-covered lair. The script reads: This is the cold little home in the North, from which old Santa is just starting forth. 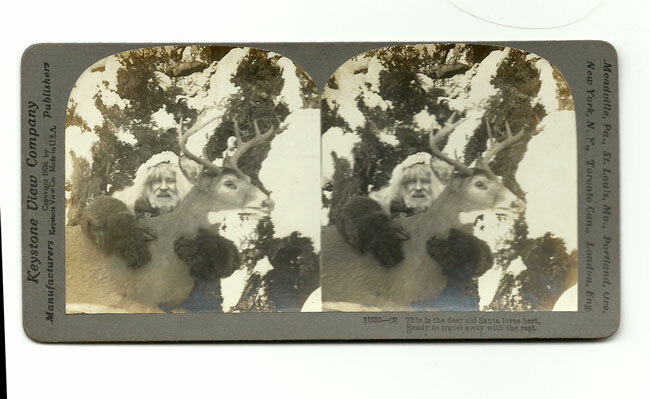 Card #2 shows the same Santa hugging one of his reindeer (which happens to look very taxidermied). Here’s what it says: This is the deer old Santa loves best, ready to travel away with the rest. It’s a bit hard to make out, but the third card shows a Santa with a much longer beard cracking the whip and urging his team of deer on. It says: This is the good old saint on the road, skimming along with his precious load. Here’s where the happy story takes a sad and dramatic turn. 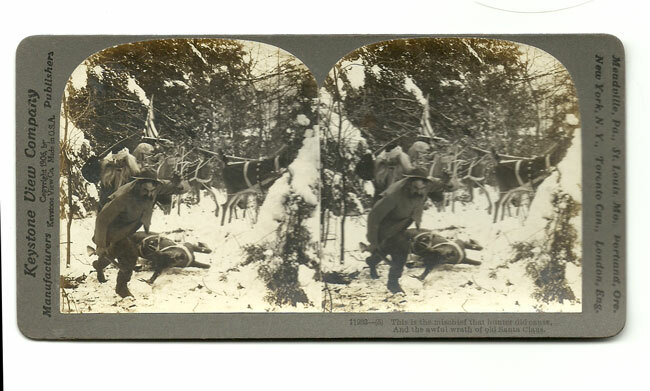 Yes, that is a hunter firing on Santa’s reindeer. The card says: This is the hunter with intention good, shooting a deer as he roams through the wood. It goes from bad to worse. Not only does a deer lie dead, but jolly old St. Nick is clubbing the nasty hunter with a stick! Here’s the next line: This is the mischief that hunter did cause, and the awful wrath of old Santa Claus. Now we see our Santa, in a terribly fake wig and beard, dragging along on foot with his giant pack of gifts on his back. The end of the story goes like this: This is poor Santa, feeling so blue, for fear he’ll be late and disappoint you. Now I ask you, would we subject our children to a cruel and humorless story like this today? I think not. Yes, we certainly have movies about “bad” Santas, and there’s a very famous Christmas movie in which a cat gets electrocuted, but parents would be up in arms if a movie depicted Rudolph – or Prancer or Vixen for that matter – being shot point blank by a hunter. Times have certainly changed, and, maybe in this instance, it’s for the better. This entry was posted in 1900's, Americana, Carol, Christmas, Ephemera, Holiday, Humor, Weird. Bookmark the permalink.